Sequel to "The Last Temptation of William Jefferson"
“Votes” takes place in Melanie Jefferson’s (a.k.a. Hillary Clinton’s) hotel room on the eve of the upcoming Presidential election, with flashbacks to the Oval Office of The White House in the 1999, when Melanie and her husband, U.S. President "William Jefferson," were in residence. Those flashbacks are, in fact, excerpts from the play “The Last Temptation of William Jefferson,” written by the team of Jacqueline S. Salit and Fred Newman 17 years ago. “Votes” is Salit's second look at the Clinton couple, their relationship, ambitions, and what they sacrifice (friends, morals, ideals, etc.) to get that one, all-important thing in politics: Votes! When the election-eve action begins in “Votes,” Melanie Jefferson (Lisa Wright-Mathews) is brimming with anticipation: The clear leader, she is poised to shatter the “glass ceiling” to become the first female President of the United States, achieving her life-long goal. 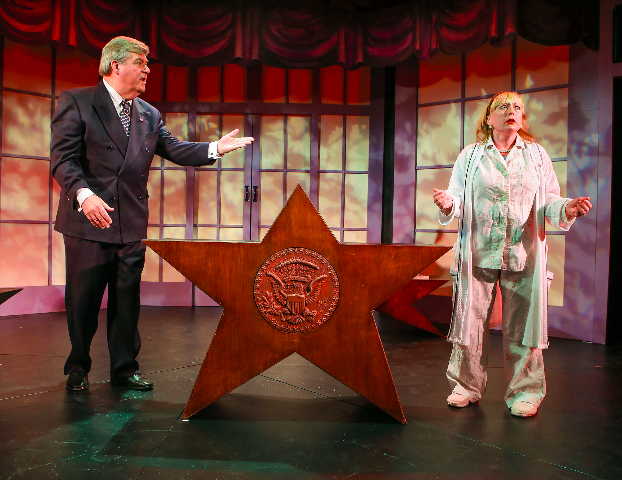 “Votes” was promoted as a “musical play” (the producers’ words), so one anticipated something like a live episode of Saturday Night Live, cynical and hysterical in the extreme, with dead-on impersonations of the Presidential candidates. At best full of irreverent song and dance, with perhaps a moral message at the end. Unfortunately, “Votes” fails to deliver on virtually every front. Let’s start with what could have been a clever conceit: Using scenes from “The Last Temptation of William Jefferson” (the authors’ play of 17 years ago about Hillary and Bill in the early White House years of his Presidency) interspersed with scenes from the present day. To shift between these two time periods, “Votes” employed an annoying gimmick that required numerous pauses in the action to rotate the set for a “scene change” between “November 2016” and “1999.” Since the two sets were virtually identical, this frankly added nothing, serving simply to slow down a play whose pace was already plodding. This interval could have been more easily and effectively achieved just with costumes, lighting and the backdrop projections. Performances were solid, but the actors on SNL are far more convincing “Clintons.” Wayne Miller was charming and needy as William Jefferson (Clinton), but his insistence that he was just a big dummy and Melanie/Hillary the brain was unnecessary and off-putting. Wright-Mathews’s Melanie rang less true, and she shifted between depressed and whiny with a little girl voice for the early White House scenes (not even remotely Hillary like), to cynical and cold for the present day. Neither of these personas earned her audience empathy, nor did they make her sudden change-of-heart “redemption” at the end of Act 2 believable. Debbie Buchsbaum as Vivian Traveler, her long-time confidante and possible lesbian lover (a superfluous sub-theme that added nothing) acts as Melanie’s conscience – nudging her towards the play’s crisis and ultimate surprise ending. And about that ending . . . The thesis of “Votes” was nothing new: The corrupt and broken political system that requires politicians to sacrifice their ideals and souls to get votes that will propel them to their goal. It’s the classic “end justifies the means” argument. For some reason in one song it was sung as “the means justifies the end” – which made absolutely no sense! So, just as Melanie/Hillary is about to achieve her lifetime goal and become the first female U.S. President, a position of power in which she can, perhaps, actually fight for and achieve some of the idealistic, unselfish goals of her youth, she . . . withdraws from the race and urges everyone NOT to vote!! Yes, playwright Salit is a long-time political independent who encouraged the “outsider” White House runs of both Ross Perot and Lenora Fulani, but is that truly the solution this play is proposing? Stay home from the polls in protest so that . . . what? The next President of the United States is . . . Donald Trump? So “Votes” gets no vote from this reviewer, who believes that the right to vote is a privilege to be cherished and taken seriously; a democratic responsibility that no one should question, even on stage and (perhaps?) in jest! Lyrics for “Votes” were written by Salit and Newman, with music by Annie Roboff, and Direction by Gabrielle L. Kurlander. Supporting cast includes Bryan Austermann, Art McFarland, Frances McGarry, Wayne Miller and Tori Ogunsanya. Votes will be at the Castillo Theatre at 543 West 42 St., NY, NY from April 1 – May 22. The play runs just over 2 hours, and tickets are $35 ($15 seniors; $10 students) and are available by calling 212-941-1234 or online at: www.castillo.org.